Sorbaria false spirea is a sprawling deciduous shrub (Sorbaria sorbifolia) that bears frothy white flowers in panicles at the end of its shoots. It will cover your slopes or fields with deep green foliage in U.S. Department of Agriculture plant hardiness zones 2 through 8. Read on for information about how to grow false spirea and Sorbaria shrub care. If you plant Sorbaria false spirea, don’t expect a prim and proper shrub that knows its place. The charm of false spirea is entirely different. Those who choose to grow Sorbaria shrubs must be ready for the plants’ unruly nature. These shrubs offer masses of overarching branches, with dark green, pinnate leaves. They also supply billowy sprays of summer flowers. Native to Eastern Siberia, China, Korea and Japan, false spirea shrubs grow to 10 feet high and wide, and keep spreading. Sorbaria false spirea grow suckers that turn into new plants. Because of this, your false spirea is likely to spread out and take over unassigned space if you let it. Is Sorbaria sorbifolia invasive? Yes it is. These woody plants have escaped cultivation and moved out into undeveloped areas in the Northeast and Alaska. One reason gardeners grow Sorbaria shrubs is because it is so easy to do so. The plants are not picky about almost anything. If you want to know how to grow false spirea, you can either plant seeds or take cuttings. The plants require little special care, and will grow in almost any type of soil as long as it drains well. Sobaria false spirea plants grows very fast in full sun. However, they also thrive in sites with some shade. And you aren’t likely to see these tough bushes threatened by insect pests or disease problems. Perhaps the most important part of Sorbaria shrub care is keeping some control over your garden once you invite false spirea in. The plants will spread fast by suckers, and even faster in loose soil, so make time to pull up suckers as they appear. You should prune this shrub every winter as part of Sorbaria shrub care. In fact, consider cutting it back to ground level every year in order to stop it from getting too dominant. 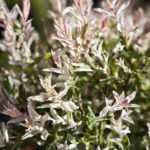 Read more articles about False Spirea.